Matoke is a variety of banana indigenous to southwest Uganda. 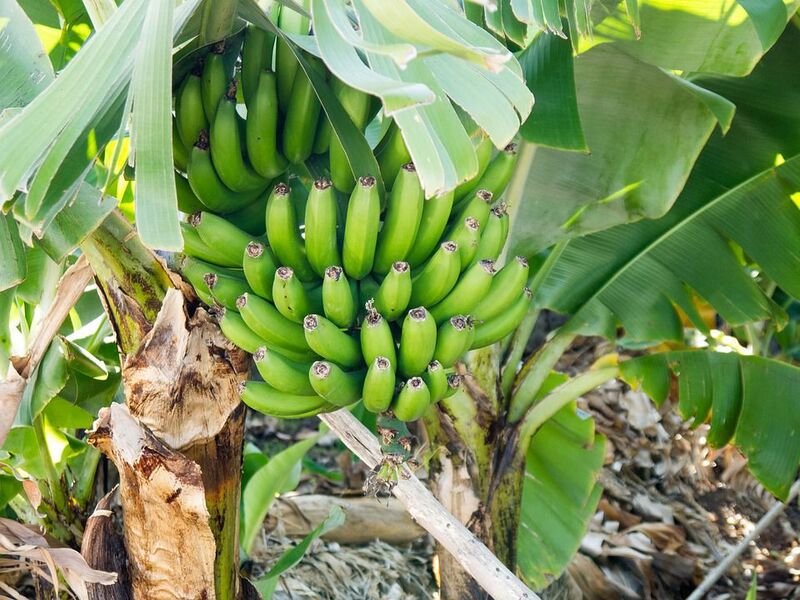 It comes from the family of bananas known as the East African Highland bananas. Matoke are used mainly for cooking when they are green and unripe. Cooked and mashed matoke is the nation al dish of Uganda. Matoke are shorter than ordinary bananas. They appear to be thick at the midsection due to their shorter-than-average length. The peel is green in color when they're unripe, which is the state in which they are most commonly used. The flesh is particularly hard due to the high starch content. It is necessary to cook the matoke very well prior to consumption. The most common methods of cooking matoke are boiling, steaming, or roasting. Once they are cooked, the flesh turns yellow and should soften to about the same consistency as potatoes. They will, however, still hold their form. If green matoke are left for too long, they will ripen as ordinary bananas would. When ripe, they are very sweet and can be eaten as normal fruit. Due to their high price, this is considered a waste because matoke are most loved as green cooking bananas and are somewhat of a luxury. Matoke are sometimes referred to as plantains, rather than bananas because they are eaten after cooking. Plantains are relatively easy to peel, though, but matoke can't be peeled in the same way as ordinary bananas when they're unripe and the process is a little more complicated. They need only to be cut at each end and slit along the length of the skin before peeling it back. To peel them, cut off the tips at each end of the banana. The banana, including the skin, is very hard such that it is not easy to penetrate with the tip of a knife. Therefore, it is necessary to peel the skin off by placing the knife at one end, ensuring it is just under the peel, and pulling back towards your body. This would be similar to peeling a potato with a paring knife. Extra care needs to be taken to do this in order to avoid any accidental cuts. Once the green peel is off, the white flesh of the matoke will be revealed. When the flesh is exposed to air, it will quickly begin to discolor. In order to prevent this, immediately place the peeled bananas into a bowl of salted water. Completely submerge them to ensure the air is kept away until you have peeled the entire batch of matoke. Boil the matoke in a pot of salted water for up to 30 minutes. Check that they have been cooked in two ways. First, see that the color has changed to yellow. Then pass a fork or knife through a piece. If it goes through without much resistance, then you know the matoke are ready to eat.